There is one more essential ingredient to my martinis: lemon. 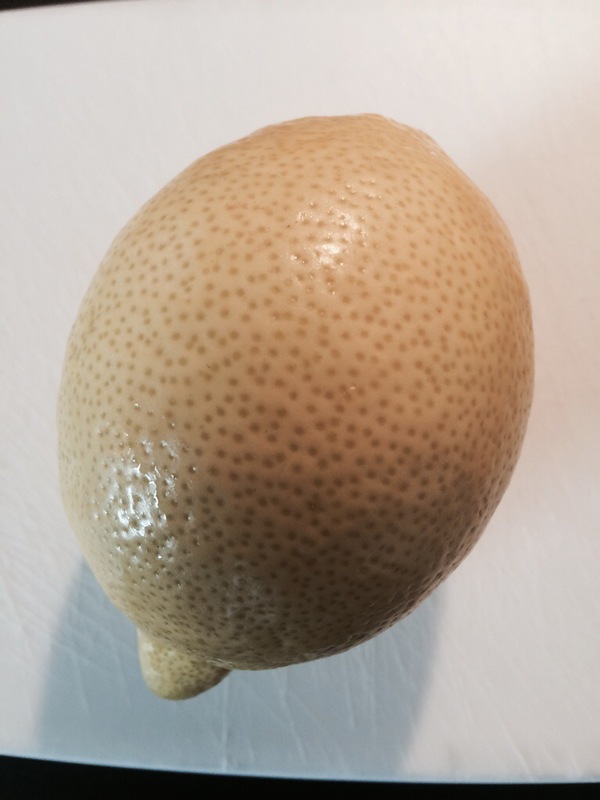 It must be fresh and firm, bright and bursting with lemon oil under its skin. It’s this oil that is the key ingredient. 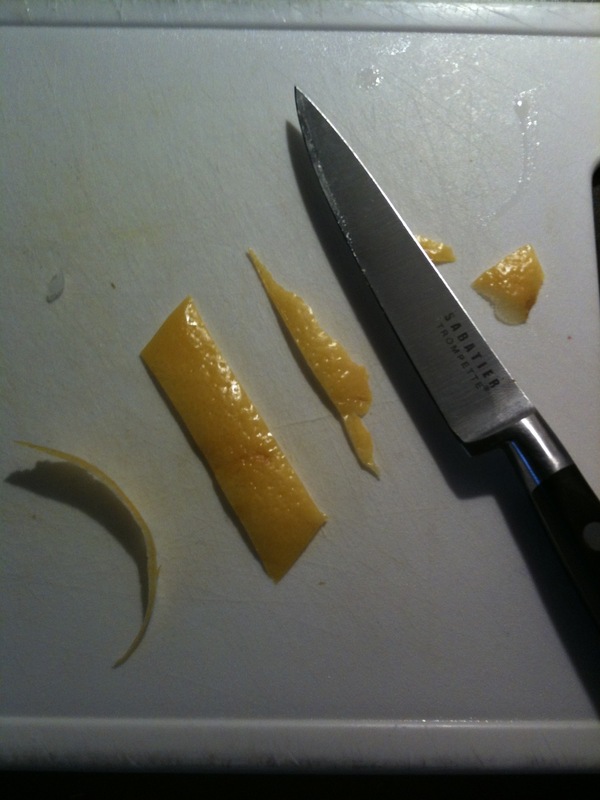 Take a normal peeler and skim off a strip of jlemon peel. With the yellow waxy side (not the white pith side) facing down, twist and squeeze the peel over the glass so that little miniature explosions of lemon oil burst out and spray the inside of the glass. I also rub the peel around the glass to transfer as much of the oil as possible. This process takes just a few seconds but it feels quite satisfying and it makes a very big difference to the overall quality of the drink. I’ve seen people set fire to the peel at some point during this process. I gave it a try and in my opinion it didn’t seem to have that much of an impact on the overall taste. Once the lemon oil has been extracted, its time to pour. Speed is crucial so that the drink can be served before it warms to room temperature so don’t dilly dally! 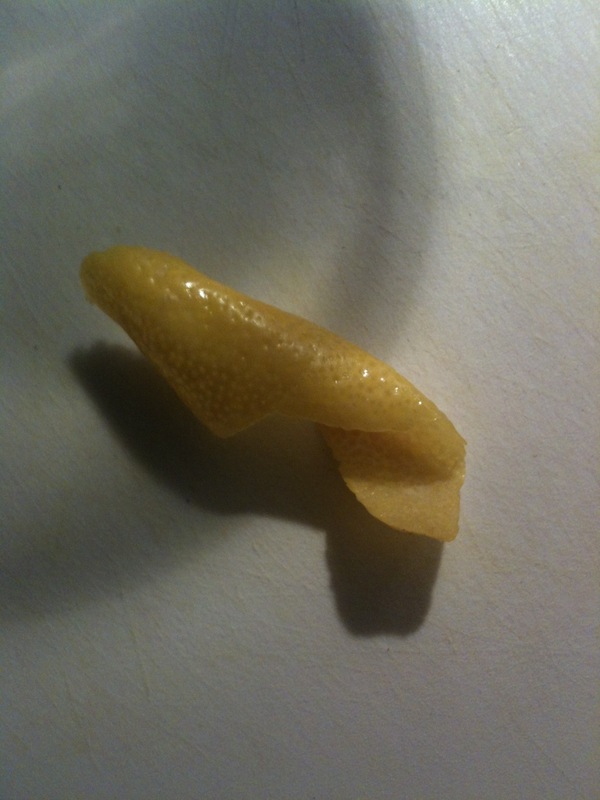 You could serve the lemon peel as the martini garnish as it is although I like to shape it quickly with a knife. Nothing fancy, just making the slightly ragged ends more neat. Alternatively, you could discard the lemon peel and serve two olives skewered on a toothpick as a classical garnish. 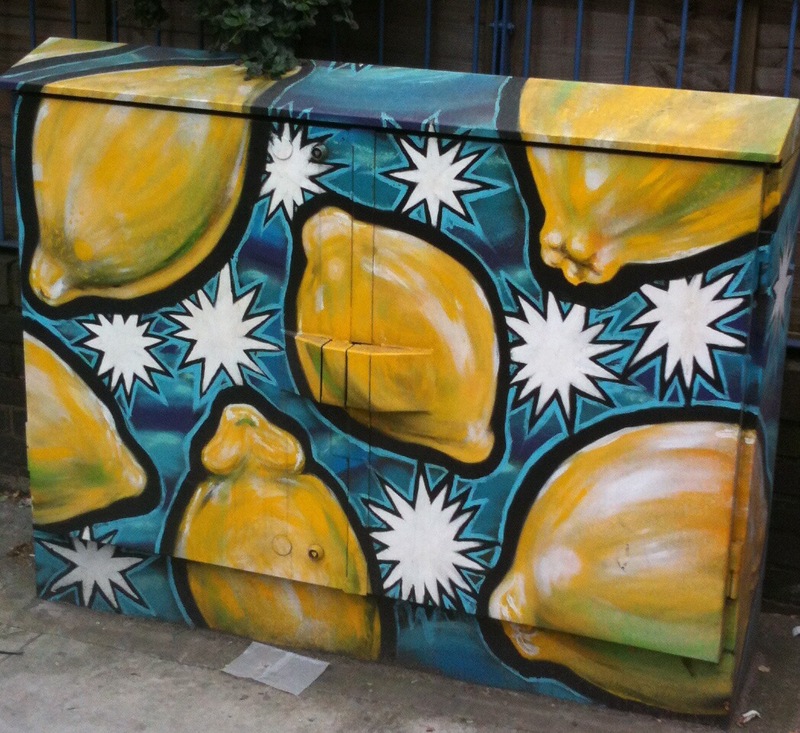 Just so we’re clear, you cannot do this with lemons which are slightly old. The oil in the skin dries out and by the time you’ve squeezed any out, the glass will have warmed up. Trust me, it just isn’t worth it. 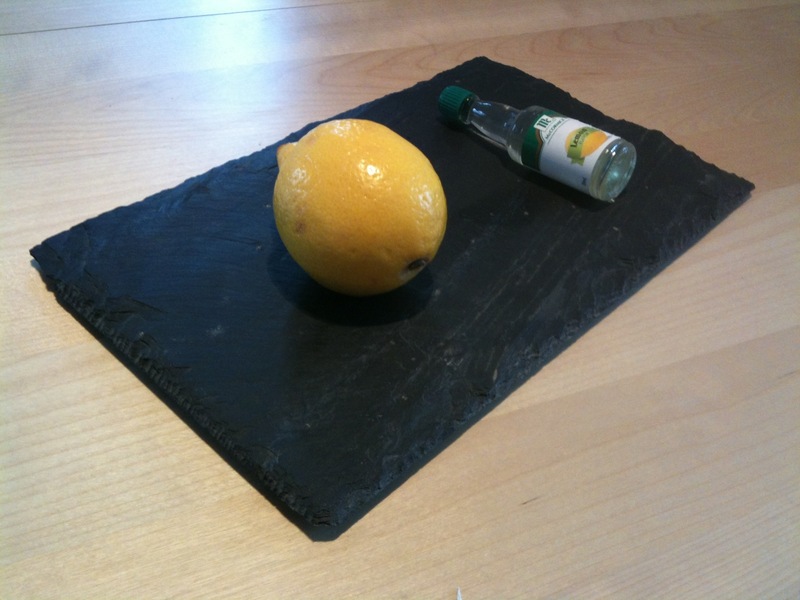 If you are ever caught out and you can’t get hold of any lemons you can use lemon oil from a bottle as an alternative. It’s not so bad! Just dip a toothpick in the bottle and use it to rub a thin streak or two of the oil into the glass before serving the alcohol. Look at those pores. They are BURSTING! 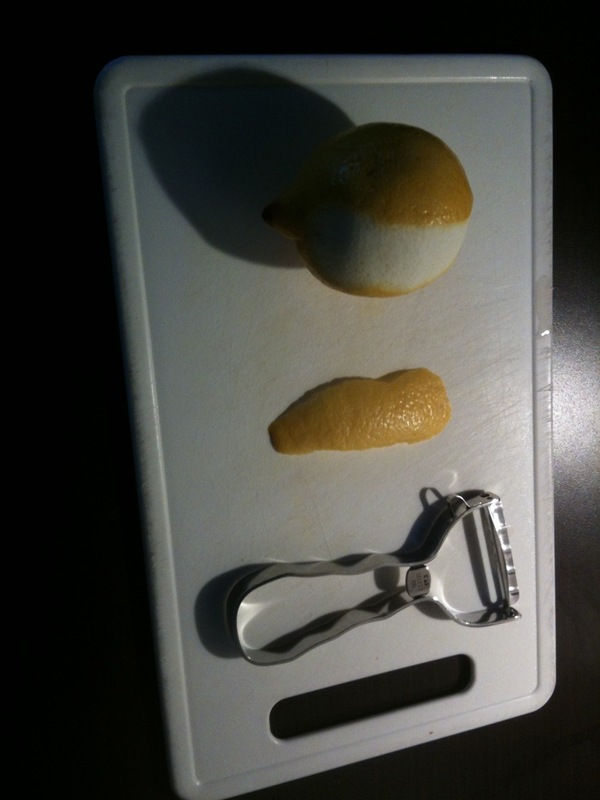 This entry was posted in How to make a martini and tagged citrus, lemon by themartinidiary. Bookmark the permalink.